This village (53Om, pop: 1,655) is situated on a hill covered with woods and extensive vineyards forming the watershed between the Pesa and Arbia valleys. Formerly belonging to the Guidi family, it came under Florentine control in 1203. After being fortified in 1400 it was, from 1415 onwards, head of the League of Chianti, and it preserves the remains of its ancient walls. The structure of the medieval village is still intact; it grew up elliptically around the church of San Nicolò, of 14th century origin and the Palazzo Pretorio. Built about 1415, its facade is adorned with the coats of arms of the podestà (chief magistrates), the latter is now the seat of the municipality. Where is Radda in Chianti: it is located in the north of Siena province, in the border with the province of Florence and Arezzo. The city’s origins go back to Etruscan times and came under Florentine control starting in the 12th century when it became an important outpost due to its strategic position between Florence and Siena. It was destroyed and rebuilt many times during the battles between the two cities and every time the town was reconstructed with bigger defensive walls. Legend has it that even Brunelleschi was asked to work on the project of new walls for the town. Along the ancient walls an impressive underground tunnel used by the guards back then remains, now called Via della Volte which today is a fascinating tunnel with shops and restaurants. I suggest you walk down the tunnel during different times of the day so that you can admire the view of the surrounding Chianti countryside with various degrees of light from the small windows along the tunnel. The tunnel itself goes around the city and encloses the delightful city center, itself divided by its main street, Via Ferruccio. Here you’ll find many shops, workshops, restaurants and important palaces such as Palazzo Banciardi and Palazzo Squarcialupi, both belonging to local noble families. Inside Palazzo Squarcialupi the Enoteca Antiquaria is now housed, a wine shop for over a 100 years old which represents an important historical archive of wine and which has helped preserving the original characteristics of Chianti Classico wine itself. The Church of San Salvatore deserves a visit. It was rebuilt in 1945 after the devastation of WWII but which still displays a valuable fresco by Lorenzo Bicci depicting the Virgin Mary with Child and a wooden statue from the Renaissance. A few steps away from the city center, theFortress with its tall tower offers a stunning panorama of the town and countryside. Inside the Fortress is the headquarters of the Municipality and the Archeological Museum of Chianti, displaying important archeological findings from the surroundings that testify to the ancient origins of the Chianti region. Tuscany is a wine region. Chianti is produced form the vines that grow in the hills between Florence and Siena. And Chianti is considered to be one of the oldest established wine zones in the world, dating its origins to the 18th century. Each town has its own wine, and each home practically has its own. Think of vino della casa as the individual especialty of a family that is used everyday at its table. 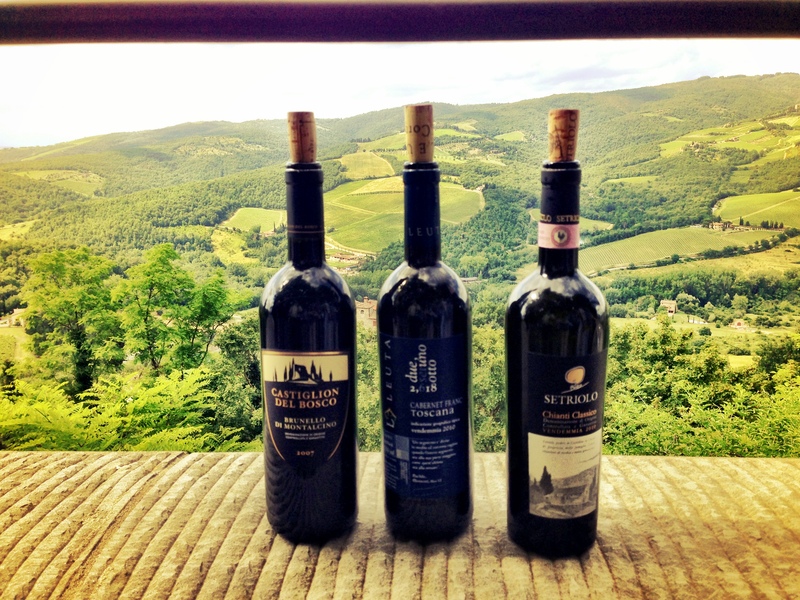 Wine is a part of the tradition of Tuscany, and one cannot go wrong trying any of its varieties. 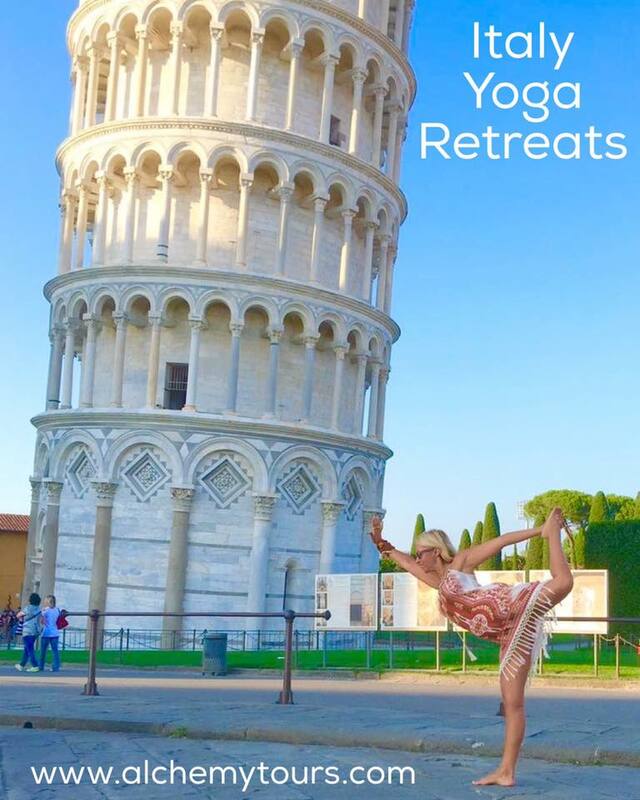 We visit Siena on Day 2 of our Tuscany Yoga Retreat! Please enjoy some information about amazing Siena! Siena is a town in central Tuscany that counts 59,000 inhabitants and it is the capital of the Siena province. It is one of the most fascinating towns in Tuscany, not only for its sights, but also for its surroundings. It preserves its medieval character to a remarkable degree, and has been largely unspoilt by new buildings. Piazza del Campo is one of the most famous squares in Italy, where the great Palio horserace takes place. In fact Siena retains a ward-centric culture from medieval times. Each ward (contrada) is represented by an animal or mascot, and has its own boundary and distinct identity. Ward rivalries are most rampant during the annual horse race (Palio) in the Piazza del Campo. In the first half of the 14th century the Sienese school of painting produced several artists such as Duccio di Buoninsegna, Simone Martini, Pietro and Ambrogio Lorenzetti, whose works are shown in the Pinacoteca, in the Palazzo Pubblico, and in the Museo dell’Opera del Duomo. The streets is Siena are steep as it was built on a ridge, so it is often necessary to cross a deep valley in order to get to the other side of the town. Consequently you need several days to visit every treasure of the town, which has to be done necessarily on foot. From the hilltop of the town, there is a wonderful varied panorama which includes Monte Amiata and the metalliferous hills, as well as the clay downs of Asciano and the wooded district of Montagnola. To the north, the scenery changes once again, with the densely cultivated hills of the Chianti. Notable people were born in Siena, as it has always been a lively cultural center: Mauro Pagani, musician, Duccio di Buoninsegna, Saint Catherine, Ranuccio Bianchi Bandinelli, archaeologist and many more. Monteriggioni is, without doubt, one of the most classical and best known Italian walled town. Since the Middle Age its fame was so big that also the great poet Dante Alighieri makes sign to his ’round enclosure’ in the Divine Comedy (Hell, chant XXXI vv. 40-41). The town walls, nearly intact, cover a length of 570 meters and are alternated by 14 towers andtwo gates. The Senese Gate is at the base of a square tower while the Florence Gate is opened in the curtain and defended from one of the towers of the fortified perimeter. The hill where Monteriggioni rises is natural, even if it could seem a great ‘motte’ (from the name of the classical Norman castles ‘Motte-and-Bailey’ built on artificial hills and gifted of enclosure), and the circular, almost perfectly, layout of the walls was obtained simply following the sketch of the ground’s curves of level. In the planning was tried of to limit the weak points for excellence, the gates, entrusting the only connections with the outside only to a east to west crossing road. To Monteriggioni the military building work appears physically distinguished by the inhabited area confined to its inside but well separated from the walls from a ‘territory of respect’, although in the ancient times the inhabited area has been more intense than today and consequently with a more narrow band of separation. The hamlet that we can admire our daysis essentially authentic, being ever been object of building and tourist speculations. The only changes to its aspect happened in the first years of the 16th century when, trying to conform the fortifications to the development of the new fire weapons, were lowered the towers andaccumulated earth at the base of the walls with the purpose to get a bastionated effect. Casole d’Elsa is a comune (municipality) in the Province of Siena in the Italian region Tuscany, located about 50 km southwest of Florence and about 25 km west of Siena. It is a charming medieval hilltop town situated in wonderful countryside around Siena. It is situated 70km from Florence and 35km from the town of Siena. Originally it was a domain of the Bishop of Volterra but in the middle of the 13th century it passed under the control of Siena. The Sienese strengthened the fortifications because of its strategical position. In 1554 Casole surrended, after strenuous resistance, to the imperial and Florentine armies during the war against Siena. The dualism between Siena and Volterra still survives in the daily life of Casole for political purposes it is in the Province of Siena, whereas it falls under the Diocese of Volterra for religious matters. Verrocchio Art School Tuscany Italy. The shape of Casole is roughly an elongated pear; it is about 400 metres long (North-South) and about 130 metres wide (East-West). The medieval walls, mainly visible on the Westside of the town, enclose it. In the middle of the village runs the main street from north to south, dividing it into two nearly symmetrical parts. View in the direction of San Gimignano. The countryside surrounding Casole is breathtaking. On a clear day one can see north as far as Apennines on the borders of Tuscany with Emilia Romagna, to the North east the hills of Chianti, to the east the mountains of the Casentino behind Arezzo and the hills of Montagnola, behind which is Siena. Looking south, following the valley of the river Elsa one can see right down to Monte Amiata at the extreme south of Tuscany, and the Metalliferrous hills with their characteristic jets of sulphurous steam. The church of San Niccolò, of Romanesque origin, has a nave and four aisles divided by columns and semicolumns, with two semicircular apses with mullioned windows. The central portal is from the early 14th century, while the portico is modern. It has 17th century frescoes by Rustichino and, at the high altar, one 14th century Madonna of the Sienese School. The collegiata di Santa Maria Assunta was consecrated in 1161; of the original Romanesque edifice, the façade remains with the bell tower. The upper part is decorated with blinds arches divided by slender semicolumns. The transept is from the 14th century. The interior houses the tombs of Beltramo Aringhieri, by Marco Romano (early 14th century), and of bishop Tommaso Andrei, by Gano di Fazio (1303). Annexed to the church is a Museum of Sacred Art with works by Domenico di Michelino, Alessandro Casolani and others. The Pieve of San Giovanni Battista, at Mensano, is also from the 12th century. Notable are the sculpted capitals of the columns dividing nave and aisles, considered amongst the finest examples of Romanesque sculpture in the Siena area. From the same period and style is the Pieve di San Giovanni Battista, at Pievescola. Casole d’Elsa is also home to the world renowned Verrocchio Art Centre offering fine art courses, painting holidays, sculpture courses, studios and accommodation. Nigel Konstam is the resident director and a sculptor whose work is firmly based in the European tradition. 1 Minute Tuscan Papardelle Pasta! Alchemy Tours Tuscany 2014 from christina russo on Vimeo. Just outside the village, in the Vignale farm, are the headquarters of the Chianti Classico consortium(its symbol is the black-cockerel, the former emblem of the League of Chianti), and the Centro di Studi Chiantigiani (Centre for Chianti Studies), founded in 1984, with a small library and an archive devoted to the history of Chianti and its agriculture. The Montevertine farm, near the village, houses the small Museo del Chianti, with displays relating to the farming community.